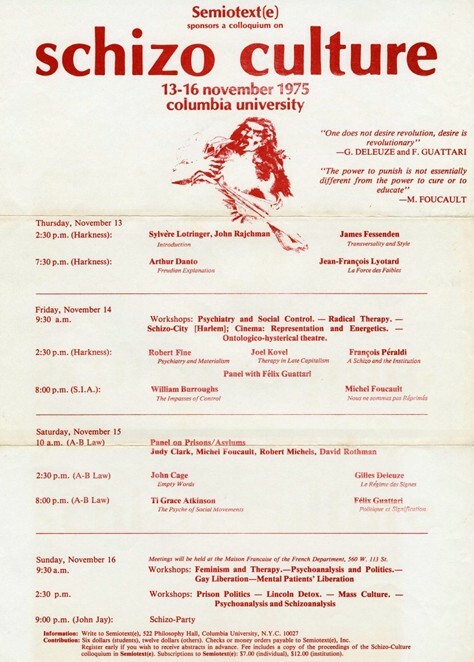 Firstly, I wanted to ask you about The Nova Convention (Nov. 30 – Dec. 2, 1978) and your involvement in it as a celebration of William S. Burroughs’ work in the late 1970s. How did the Convention come about? 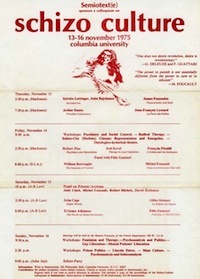 I met William Burroughs at the Schizo-Culture Conference in November 1975. I was just back from one year in Paris and he was just back from a long self-imposed exile in London. The context of Schizo-Culture was definitely political — it was about madness and prisons. Felix Guattari had been extensively involved in treating madness. He co-directed the La Borde clinic south of Paris, well known for its innovative and unconventional treatment of mental patients. The clinic was the French version of British anti-Psychiatry movement. Both Felix Guattari, Gilles Deleuze and Michel Foucault, who attended the conference, were involved with the question of madness and psychiatric treatment. Foucault had been closely involved with the question of prisons and was part of a group which included inmates. All of them knew of — and of course — admired Burroughs’ work and they had a chance to meet him at the conference. My intentions when I organized the conference were to put together the most formidable French theorists with the most creative American artists and writers (John Cage, Cunningham, etc). I realized that Burroughs was widely considered a “has been” in America. He had had his 15 minutes of fame in the 50s, and he had a hard-time finding a publisher in New York. 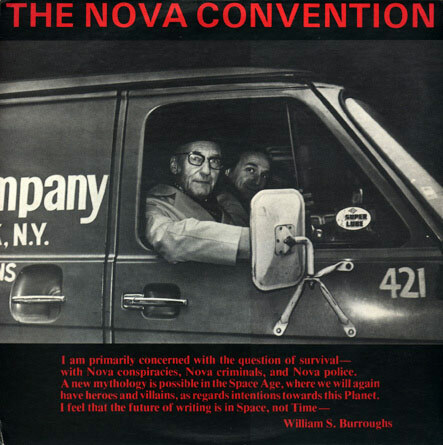 Burroughs was revered in Europe, and once more, I tried to bring the two together by organizing another event — The Nova Convention — but exclusively around him this time. Was Burroughs himself initially enthusiastic about such a celebration of his work or was he more reticent about the idea of such public adulation? Just reading over the statement that’s on the poster that I’m primarily concerned with survival with the question of Nova conspiracies, new mythologies possible in the space age, heroes and villains with regard intentions toward this planet. I realized this is a very political statement. If we see the earth as a spaceship and go further to invoke the comparison of a lifeboat, it is of course of vital concern to everybody on the boat that if the crew and the passengers start polluting the supplies of food and water, distributing supplies on a grossly inequitable basis, knocking holes in the bottom of the boat or worst of all plotting to blow the boat out from under us. And what more blatant Nova Conspiracy than the development and use of an atom bomb. As the founder of the Nova Conspiracy Phillip [sic] Oppenheimer said, “We have become Shiva, destroyer of worlds.” Well, he may have been a little confused on his Hindu mythology but the spirit was there. And I’m beginning to realize that the readings that I’ve been giving in the last three years while seemingly apolitical are in many cases very definite political statements. Burroughs detested politicians and considered the current ideologies with utter disdain. He was some kind of free libertarian, adept to skepticism and cynicism. But he wouldn’t have minded if one wanted to call “political” his preoccupations with the fate of the planet. It was. Burroughs’ statement to the Nova Convention and his views on the environment seem eerily prescient wouldn’t you agree? What I always liked about Burroughs is that he had a very sharp, analytical, pragmatic mind. The idea that humans were destroying their own environment wasn’t original per se, but it fit his lucid and apocalyptic mind. What happened to Keith Richards and his planned appearance at the Convention? It was speculated that his non-appearance was due to drug problems due to a heroin bust in Toronto? That’s what I heard myself. I was not in direct contact with him. We didn’t realize that this huge event would be an adieu to the American avant-garde. No other event after that gathered so many of the artists, poets, musicians of the underground scene. The whole idea of an artistic avant-garde collapsed in the 80s. How do you feel that Burroughs’ work can be assessed in the present context? My interest in Burroughs’ work has not changed, and I don’t think that Burroughs’ stature has suffered any decline after that. To the contrary, he has become quasi-mythical and certainly will remain one of the most inventive writers of the century. Many thanks to Sylvère Lotringer. Interview by Marcus D. Niski published by RealityStudio on 14 September 2012. Intersting inertview, shame it was not longer. Thanks for posting it. “How do you feel that Burroughs’ work can be assessed in the present context? What would it take to awaken the avantguard? Cultural memes do have an effect on Politics. Burroughs, Foucault have ignited a fire, a paradigm shift. The ashes must be kept somewhere?